HELP US IN MAKING YOUR CAMPUS JOB-READY. 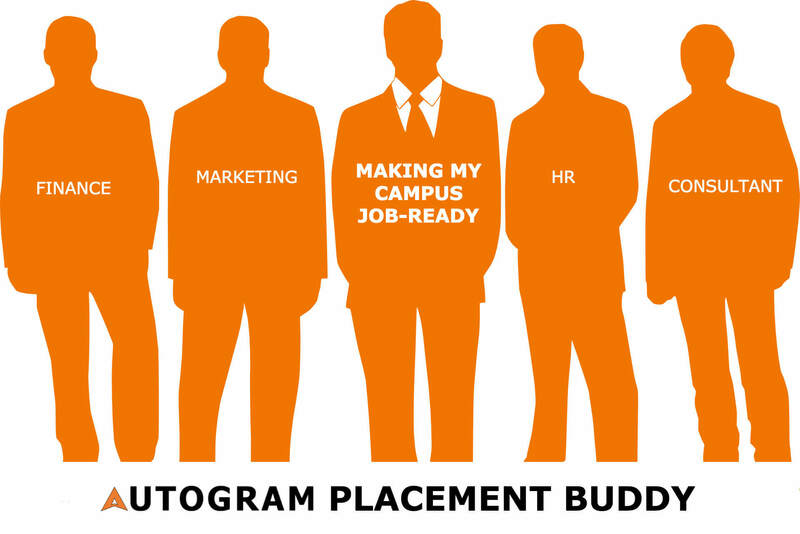 AUTOGRAM PLACEMENT BUDDY (APB) is a 4 months transformational program aimed at building the leaders of tomorrow. We at AUTOGRAM, believe that we can actively collaborate with Students, right from their university level in an effort to build a greater Entrepreneurial community in INDIA for the years to come. This is not your typical campus ambassador program. You’ll bring fun and not push products; , relevant resources that actually work for your peers. You will represent a community and not a brand. YOu will learn and grow professionally at the same time. We want everyone to get an equal opportunity to apply to their DREAM JOB(s) not just basis academics, but also on the basis of personality and talent. Yes! there are exciting rewards up for grabs as well - including financial incentives, rewards and a chance to get a Full-time Job in AUTOGRAM. A credential differentiating you from the stack of Resumes. APB Kit including Gift Vouchers and Goodies. Personalised Interview/Skill Development Training via Webinars. A chance to get a direct interview with Top Recruiters on our platform. Are you a motivated and energetic self-starter? Are you connected to your friends and college community through social networks and on-campus involvement? Do you like interacting with your friends and classmates- and enjoy making extra money? Do you want to help your peers make the BEST AUDIO/VISUAL RESUME? Do you want to feel proud of helping your peers getting placed in top companies? Since, every company cannot visit every college campus in India, AUTOGRAM is virtually bringing lot of companies to your campus. Students can show case their PERSONALITY, COMMUNICATION SKILLS and TALENT along with ACADEMICS to these companies just from a smartphone APP. LAST YEAR 300+ Students from 40+ cities in India got their DREAM JOB through AUTOGRAM. What are you waiting for? Join this program and be a part of a leadership journey like never before. 1. What will I do as an AUTOGRAM PLACEMENT BUDDY? To conduct survey about the desired domain and job roles among the students. Assist our experts in building the Mock Interviews for the desired roles. Help in conducting Mock Interviews for various students in your college to prepare them for future interviews. Create awareness among your peers by sharing on SOCIAL MEDIA platforms and distributing flyers. Any college student who has the desired skills and the hunger and who wants to experience the excitement of a growing startup, can apply. If you are a student coordinator or a member of any other club or group inside or outside his/her college, you will have an advantage. APB is open to students of all streams and years. 3. What is expected of me as an APB? Your core responsibility would be to promote the concept of AUTOGRAM, its JOB/Internship opportunities on your campus. We will provide you with a lot of support, mentoring, marketing ideas and materials, and we also expect you to tickle your creative bone and come up with innovative ideas. We love innovation! 4. What is the duration of the APB program? The APB is a 4 months program starting in December 2018 till April 2019. 5. How many hours a week I need to devote for APB and what about during exam time? We would expect you to spend about 3-4 hours a week. But then again, it completely depends on you - more you can do, more you can expect in return. Exam breaks are perfectly fine with us and you are not expected to devote any time to APB during exams. 6. Will it add value to my Credentials? Yes! Remember, a lot of companies have started using AUTOGRAM to hire people. So, your profile will be recognized wherever you apply in future. 7. How does the financial incentive work? Apart from the Certificates, Goodies and lot of learning, we have an amazing incentive structure. Since, you will be helping your friends in becoming JOB-READY, we want to reward you for your efforts. 8. I have more questions about the program that have not been answered here - what do I do? Email us at support@myautogram.com. We would be happy to assist OR better call us at +918420033993.